Created through Dynamis currency, Relic Weapons are powerful high-damage and low-delay weapons, though costly to obtain. 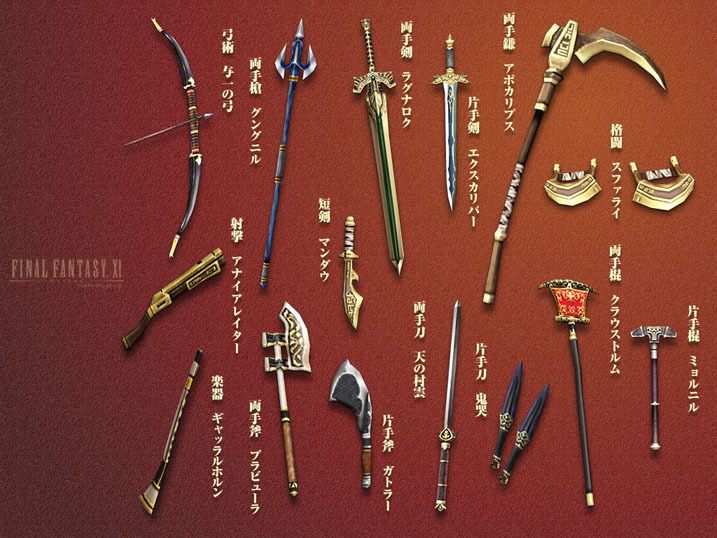 Once a weapon has been upgraded to the forth and final stage, a unique weapon skill becomes available to the player based on the weapon. Follow this link to learn how to obtain a relic weapon. This page will show you what is required to reforge each relic weapon to its full lvl 99 form. After completing the fourth stage of your Relic Weapon, they can be further reforged through their level 99 variants with Magian Mog TJ. You can type $trial at any time to check your progress in any custom trials on the server. Mythic Weapon Trials do not count against this. When trading the Tanzanite Jewels to Magian Mog TJ, you must trade the jewels first, then the weapon that you are upgrading for the trial. In order to progress to the next level there is a pool of Notorious Monsters you can choose from in order to advance. You can choose to kill any of them, the only requirement is that you kill a total of nine from the appropriate tier. For example if you wanted to upgrade your Mandau, you could kill Mischievous Micholas six times, Dune Widow twice, and Intulo once. You will have sucessfully completed this stage of your Mandau upgrade since the total number of monsters defeated has reached nine. This page was last edited on 24 May 2018, at 20:52.